Birdfinders remain the only tour company to consistently and successfully send tours to southern Israel in spring, and have done so annually since 1996, only missing 2003 due to the political situation. Although this year didn't match to the tour record established in 2006, the 189 species that we did see compared favourably with the totals of 2004 and 2005. Highlights included a wonderful evening with Hume's Owl, bird of the tour for many, but a Dunn's Lark near Yahel came very close to taking top honours as the best bird of the trip. It was certainly rarest in West Palearctic terms, being new to everyone in the group except the leader. A Tundra Bean-goose (new to Israel) was seen on several mornings during the tour, feeding on a soccer field in the early morning just 400m from our very comfortable hotel in Eilat. Three displaying Macqueen's Bustards were seen in the western Negev, with Cream-coloured Coursers, Asian Desert Warbler, Semicollared Flycatcher, and stunning views of Long-eared Owl and Syrian Serin being just a few of the highlights on our two-day sojourn into the Negev. 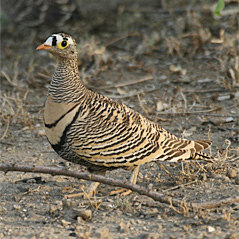 Four species of sandgrouse were noted, including Lichtenstein's, and point-blank views were had of Arabian Warbler in a remote desert wadi seen alongside other Sylvia warblers such as Eastern Orphean and Rüppell's. Due to unfavorable winds raptor movement was patchy at best, but we did get to see some of the famed migration, with an impressive movement of Common ‘Steppe’ Buzzards, Black Kites and other raptors along the spectacular escarpment of the Dead Sea at Ein Gedi. Indeed, our afternoon was Ein Gedi was excellent, producing an Imperial Eagle on migration and excellent looks at Tristram's Starling, Fan-tailed Raven, White-breasted Kingfisher and Indian Silverbill. That evening, we also caught up with the ultra-rare Nubian Nightjar and Clamorous Reed Warbler. Other good birds seen during this trip included Striated Heron and Western Reef-heron, Greater Flamingo, Pallid Harrier (including two males), Lesser Spotted, Greater Spotted and Steppe Eagles, Lesser Kestrel, Lanner and Peregrine (Barbary) Falcons, Chukar, Sand Partridge, Greater Sand-plover, Spur-winged Lapwing, White-eyed Gull, Pallas’s, Slender-billed, Armenian and Lesser Black-backed (Heuglin’s) Gulls, Namaqua Dove, Pallid and Alpine Swifts, Pied Kingfisher, Little Green, Blue-cheeked and European Bee-eaters, Syrian Woodpecker, Bar-tailed, Desert, Bimaculated and Crested Larks, Rock Martin, Red-throated Pipit, Citrine Wagtail, Yellow-vented Bulbul, Palestine Sunbird, Isabelline, Mourning, White-crowned, Desert and ‘Eastern’ Black-eared Wheatears, Rufous-tailed Rock-thrush, Blue Rock-thrush, Graceful Prinia, Eastern Olivaceous, Subalpine, Sardinian, Cyprus, and Eastern Bonelli's Warblers, Southern Grey, Masked and Woodchat Shrikes, Brown-necked Raven, Dead Sea Sparrow, Pale Rock Sparrow, Trumpeter Finch, and Cretzschmar's Bunting. This tour was greatly enhanced by our hard working and well humoured group, all of whom contributed to some first-rate birdfinding and a very enjoyable tour. Special thanks go to Phillip Hasell, Gail Marsden, Martin Painter, Garry Rowe, Clifford Sharpe, Ken and Margaret Smith, and Brian Stoneham.